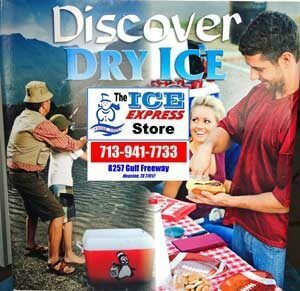 Camping: Keep refrigerated items cool for 3-4 days by packing your cooler with Penguin Brand Dry Ice. Place Penguin Brand Dry Ice in the bottom of the cooler, cover with cardboard or newspaper, completely cover with wet ice, then pack your cooler as normal with food and beverages. Penguin Brand Dry Ice freezes the wet ice and everything in your cooler stays nice and chilled for days. No more trips to the convenience store because the ice melted. And no leaky coolers. Penguin Brand Dry Ice sublimates (turns into a gas) so everything stays cold but not wet. Hunting or Fishing: Use Penguin Brand Dry Ice to preserve your trophy. Place Penguin Brand Dry Ice in the bottom of a cooler. Cover with newspaper or cardboard and place trophy on top to prevent spoilage. Remember, do not allow direct contact of trophy with dry ice as this will cause superficial damage. Picnic, Beach or Boating: Penguin Brand Dry Ice allows you to take ice cream, Popsicles, or lemon meringue pies on your next outing. Even sodas and refrigerated items will stay nice and cool. Only taking one cooler? Pack items to be frozen on one side, and refrigerated items on the other. Use cardboard as a divider. Place 5 lbs of Penguin Brand Dry Ice on top of the items to be frozen and a few pounds on the bottom of the other side of the cooler with newspaper or towel on top. You’ve created a convenient side by side non-electrical refrigerator. Backpacking: Backpacking for a day? Wrap a pound of Penguin Brand Dry Ice in a towel and place in the bottom of your backpack. Put your beverages on top of the dry ice. When you are hot, tired and ready for a really cold beverage, reach into your backpack and pull one out. Best of all, Penguin Brand Dry Ice doesn’t leave a mess in your backpack and you stay nice and cool too! Tailgating: Don’t deal with a cooler full of ice water and soggy food. Use Penguin Brand Dry Ice to keep your cooler cool and your food and beverages cold. Place the dry ice on the bottom of the cooler, cover with a bag of regular ice, then pack the cooler with all your tailgating items. Halloween: The scariest spook houses are dark with lots of hovering fog. Use Penguin Brand Dry Ice to create fog by placing a few cups of hot water into a plastic or metal cauldron. Add a few small pieces of dry ice to create instant fog. Add dry ice as needed. Use a crock pot of hot plate to keep water warm. Witches brew is extra scary when dry ice is added. The mysterious bubbling seems like boiling frogs stew rather than punch. Your guests will love the punch and the special effect. Use 1 gallon of red grape juice and 1 gallon of extra pulp orange juice (refrigerate both juices prior to use). Mix together and add a few small pieces of dry ice when ready for the bubbling effect. Do not serve dry ice to your guests. Little League Sports: It’s 90 degrees outside and the team is really hot and tired. What is more refreshing than Popsicles on a hot day? Use Penguin Brand Dry Ice to keep the entire team cool to the end of the game! Place the Popsicles in the bottom of the cooler and put Penguin Brand Dry Ice on top. The team will really enjoy the frozen treat! Fundraising: You don’t need electricity to sell ice cream and Popsicles (or other frozen desserts). All you need is a bag of Penguin Brand Dry Ice, a cooler and Popsicles from a local ice cream wholesaler or grocery store to raise lots of money for your cause. The cost is minimal, you can set up in the perfect location and you are selling a unique item. Your patrons will love you and your cause! Severe weather: As you run to the store to pick up milk, bread, water, batteries, and other essentials, pick up a few bags of Penguin Brand Dry Ice. Use 1.5 lbs per 1 cubic foot of freezer space. Place dry on a shelf above the items to be kept frozen and place the dry ice on a shelf in the bottom of the refrigerator to items cool. Using the appropriate amount of dry ice will keep foods from spoiling for up to 3 days. Refrain from opening the refrigerator or freezer, do not place dry ice directly on glass shelf and do not use in an operating refrigerator or freezer.